Not to be confused with Bann Bridge. Banbridge had three major bombings during the Troubles. On 15 March 1982, a Provisional IRA bomb on Bridge Street killed a schoolboy and injured 36 people. On 4 April 1991, another IRA bomb of 1,000 lb of explosives caused widespread damage and injured a police officer. There was also a dissident republican bombing on 1 August 1998 after the signing of the Good Friday Agreement (see 1998 Banbridge bombing). 6.83% had some knowledge of Irish (Gaelic) and 6.35% had some knowledge of Ulster-Scots. One of the Game of Thrones sets is in Linen Mills Studio, which was converted from a failed linen mill. 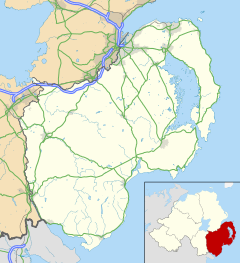 Wikimedia Commons has media related to Banbridge. "Banbridge" . Encyclopædia Britannica. 3 (11th ed.). 1911. ^ Daein Gairdens fur Wilelife Northern Ireland Department of the Environment. ^ G.M. Miller, BBC Pronouncing Dictionary of British Names (Oxford UP, 1971), p. 10. ^ "Banbridge". IreAtlas Townlands Database. Retrieved 15 April 2015. ^ "Banbridge". Census 2011 Results. NI Statistics and Research Agency. Retrieved 30 April 2015. ^ Young, Alex F. (2002). Old Banbridge. Catrine, Ayrshire: Stenlake Publishing. p. 3. ISBN 9781840332049. ^ Young, Alex. Ibid. p. 3. ^ "Northern Ireland Placenames Project". Archived from the original on 1 October 2010. Retrieved 30 May 2010. ^ "White Widow Samantha Lewthwaite now world's most wanted woman" – via www.belfasttelegraph.co.uk. ^ Hajducki 1974, p. xiii. ^ Baker 1972, pp. 146, 147. ^ a b Baker 1972, p. 207. ^ Harrison, Sharon (24 September 2018). "Banbridge site selected for Game of Thrones formal studio tour". Armagh City, Banbridge and Craigavon Borough Council. Retrieved 28 February 2019. Baker, Michael H.C. (1972). Irish Railways since 1916. London: Ian Allan. ISBN 978-0-7110-0282-1.